Where’s the Public Outrage About Big Money in Politics? 200 people currently contribute 85% of all the money put into Super PACS. We should be furious about that. As a country born from revolution, America knows a lot about outrage. Outrage over unfair treatment led our founders to declare independence. Anti-federalist outrage over Constitutional shortcomings led to the enshrinement of our fundamental freedoms in the Bill of Rights. In fact, in a functioning democracy, there are few things that get more done than outrage. A government by the people, of the people, for the people should be responsive to the people, after all, and outrage is the most vocal manifestation of the people’s will. That outrage comes into play politically at the ballot box, either because it inspires voters to get out and vote or motivates politicians to act so they don’t wind up on the wrong side of election day. In recognition of the importance of the American public’s right to vote, the Constitution has been amended numerous times to give that right to more Americans—to people previously excluded from the political system as a means of consolidating power in a ruling class. The 15th Amendment gave Americans the right to vote no matter the color of their skin and the 19th Amendment extended that right to all Americans no matter their gender. In 1971, soldiers returning from Vietnam demanded that if they were old enough to fight and die for their country, they were old enough to vote, leading to the passage of the 26th Amendment changing the voting age to 18. The largely unchecked ability of multinational corporations and moneyed interests to fund political campaigns has given excessive political power to just 200 people—the less than one ten-thousandth of the American population that currently contributes 85% of all the money put into Super PACS. Candidates who raise and spend the most money win more than 92% percent of the time. Presidential election spending has risen a staggering 1,435% in the last 10 years. The incredible expense of modern political races gives those 200 people an outrageous amount of influence in the electoral process and weakens the force of the American electorate. Our democracy has been auctioned off to a corporate-controlled gaggle of billionaires loyal to their bottom lines instead of their country. This same group advances trade agreements like NAFTA, CAFTA, TPP and TTIP that endanger our labor market and manufacturing infrastructure, sending American jobs oversees and flooding the workforce with low salaries, low benefits, and low opportunity. They pillage our natural resources, fracking, drilling, mining, and polluting with no interest in the aftermath outside of their profit margins. They grease wheels in Washington to help avoid regulatory oversight, leading to abuses in the financial sectors that have proven significant enough to shake the foundation of our economy and send America into recession. They pass the burden of cost off to taxpayers by using their influence to secure subsidies and lenient banking and tax regulations. And they’re able to do all of this because they buy influence. If history teaches us anything, it’s that only sustained outrage can shine a light on this problem and result in a solution. 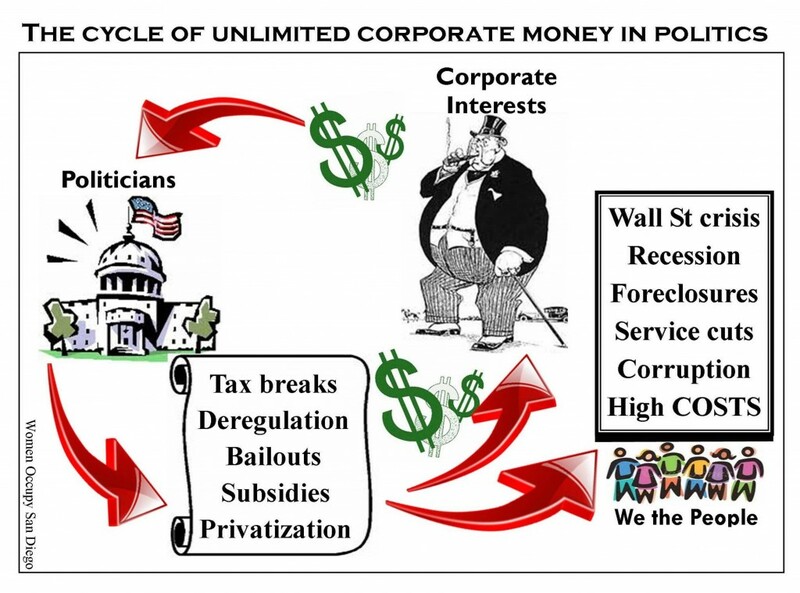 But the problem today is that there seems to be little public outrage over the current crisis of big money taking over politics, in part because the same corporate entities seeking to shore up their influence with big money political donations own or control one of the primary tools for stoking outrage in the first place: the media. So what options are there for overcoming these hurdles and making politicians responsive to their people, not their pocketbooks? The removal of money from the political, judicial, and regulatory process is almost a complete solution. But the options to get there are remarkably narrow. Even though a staggering 85% of the American population recognize that money is killing our democracy, there is still no palpable outrage like we saw in the history leading up to the 19th Amendment granting women the right to vote. Both women and men had turned up their outrage to the point that they were willing to go to prison, willing to be attacked by angry police with clubs, willing to invest their personal time and money into an endeavor that at the time appeared to be near impossible. But they proved that it was possible during a time when America, its politicians, its judiciary and its media was insanely conservative. As PAC money, protected by Supreme Court rulings like Citizens United and, more recently, McCutcheon, filters into local races, from judges to school board and county commissioners, the need for strong, decisive action in the form of a constitutional amendment removing money from politics is more important than ever. To make that happen, 34 state legislatures would need to propose an amendment that would ultimately need to be ratified by 38 states. No amendment to the Constitution has ever been successfully ratified through the states, however. The typical alternative requires a two-thirds majority in both houses of Congress. But considering partisan fault lines in Washington the influence K Street lobbyists have built, the drive for a constitutional amendment needs to start where it so often has—in public outrage. For our entire national history, the American people have recognized the need for outrage and action to protect our political voice as Americans, as embodied in our vote. Now we must fight, not just to expand voting rights but also to protect the gains made by centuries of Americans and to ensure that America remains a government for the people, not for profit. Mike – great article, I’m of the opinion that campaign fund raising and special interest lobbying are the source of much which is lacking/wrong in the United States. I would be interested in knowing more about your sources regarding the 200 people and 85% of the money, and the 92% election rate achieved by the candidates who raise/spend the most money. Also, I know one of the first things I’ll hear in rebuttal, from my social contacts who see nothing amiss with the current system, is labor unions are part of the 200 people. Can you elaborate on where labor/unions rank in PAC contribution making. Thanks again for your article and for quantifying what I’ve intuitively perceived as a huge problem in our country. The article is certainly right about the flood of money that is corrupting our democratic system. But it takes time to make changes. Already 16 states and a US Senate committee has called for a Constitutional Amendment to stem the money tide. Look how long it took to move against Trusts late 19th Century issue that was addressed by Teddy Roosevelt. People are waking up, it will happen.